(Newser) – The classified Democratic memo written in response to the classified Republican memo released three weeks ago has itself now been released after getting the go-ahead from President Trump on Saturday, CNN reports. The GOP memo prepared by Rep. Devin Nunes claimed the FBI abused its powers when it secured surveillance on Trump campaign adviser Carter Page, though both the Democrats and FBI director accused the memo of omitting important facts. According to CBS News, Trump later claimed the GOP memo "totally vindicates" him in Robert Mueller's investigation. The president had blocked the release of the Democratic rebuttal memo earlier this month over concerns about sensitive material. 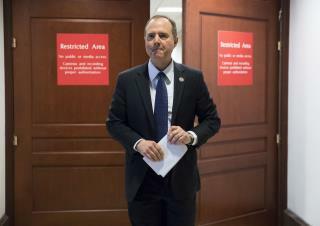 A redacted version of the memo was posted online Saturday following negotiations between Democratic Rep. Adam Schiff and the FBI. Schiff for brains, dripping from his "rebuttal."